Local police say safety has to be the priority in bicycle lane regulations. Dedicated bicycle lanes along Beacon Street from Newton Centre by Boston College to the Boston city line may be confusing drivers and causing a few traffic tie-ups, but Newton officials say that’s just an expected, short-term hiccup as bicycle safety is made a priority. As motorists and cyclists become more familiar with the new rules of the road and traffic engineers tinker with the plan, police, bike advocates, and officials believe the slowdowns will be alleviated. More aggressive enforcement of bicycle and pedestrian safety laws in Newton, as well as in other communities across the state, will be starting shortly and lasting for several weeks with federal funds distributed by the state Executive Office of Public Safety and Security. The competitive grants that are available to all municipalities range from $7,500 awarded to large communities such as Cambridge to $3,000 awarded to several communities based on need and population, according to Terrel Harris, communications director for the office. The grants were distributed to 48 communities across the state, including Arlington, Bedford, Belmont, Cambridge, Concord, Holliston, Milford, Newton, Northborough, Waltham, and Wellesley. The money will pay for extra police hours. In Concord, for example, a $3,000 grant will mean approximately 56 hours, said police Sergeant Brian Goldman, who said officers will concentrate on pedestrian safety, particularly at crosswalks downtown and in Monument Square. Goldman said there are no dedicated bicycle lanes on roadways through Concord, and no plans to start drawing them, but in late March and April several bicycle clubs will begin riding through town. “We’re somewhere along a popular route,” he said, adding that area cycling groups rather than tourists on bicycles are the norm. The department works with the cycling groups, according to Goldman, who said there is usually a point person. Police relay information to that person, who spreads the word to the group’s members. In Concord, Milford, and Holliston, police officials say crosswalk enforcement will be a priority. Extra patrols — and in some cases officers posing as pedestrians — will issue warnings and tickets to drivers who don’t stop for people waiting to cross. Milford Police Chief Thomas J. O’Loughlin said his department will also enforce a local ordinance preventing bicycle riding along the sidewalks through downtown. Other than the Upper Charles River Trail that goes off-road through town, there are no dedicated bicycle lanes in Milford, according to the chief. While there appears to be a steady and fairly rapid uptick in the number of cyclists across the state, David Watson, executive director of the bicycle advocacy group MassBike, said the numbers don’t suggest that cycling is getting more dangerous. Drivers can be fined $100 for driving in a dedicated bicycle lane, even if there are no bicycles in sight. In Newton, Police Chief Howard Mintz continued to make bicycle safety a priority after being promoted to the position from head of the traffic division. All officers in the Newton Police Department, not just those assigned to traffic, are being trained in bicycle laws and what to look for when on patrol, according to Babcock, who said the grant money is being augmented by department funds to pay for the training and enforcement measures. 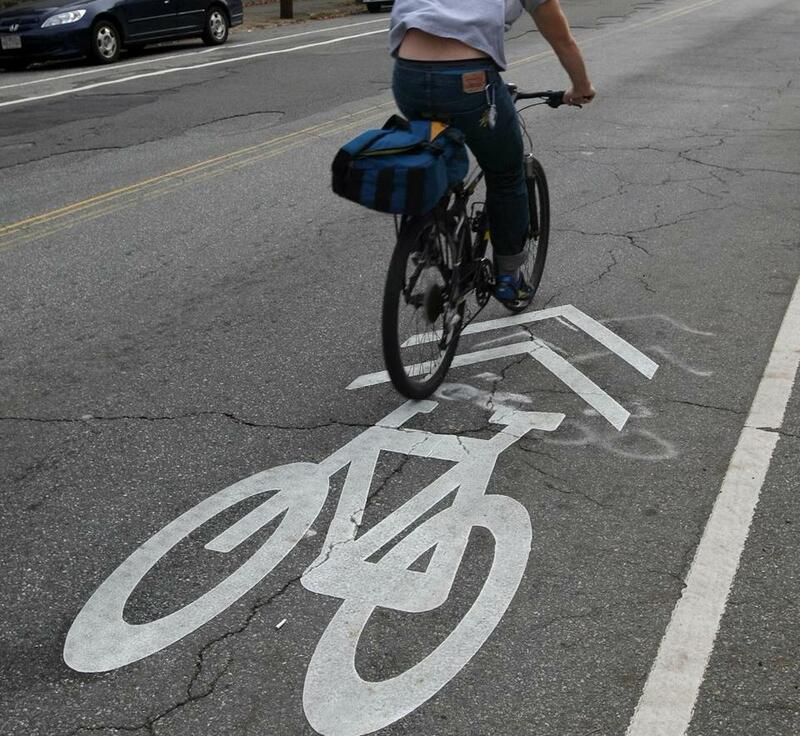 There has been some confusion along Beacon Street, particularly in Newton Centre, since the initial bicycle lanes were painted last year. They are the first in a series of lanes that will be painted across the city over the next several years, according to William G. Paille, director of transportation in Newton. The primary bike lanes run on both sides of Beacon Street from Langley Road to Boston. The solid lines indicate a dedicated bicycle lane where vehicles cannot travel, and dotted lines indicate a shared lane where cars can enter. Drivers can be fined $100 for driving in a dedicated bicycle lane, even if there are no bicycles in sight, according to Babcock, who said the added patrols will be issuing warnings and tickets to violators. Paille said the city was careful to start the project slowly, avoiding the need to eliminate any parking spaces for the bicycle lanes in Newton Centre or the three spaces in front of homes on Beacon Street. “We didn’t want to go in and start a firestorm,” he said. The city also made changes in the lanes this spring to help alleviate some tie-ups, including changing a short stretch across from Glen Road from a dedicated bicycle lane to a shared lane so motorists aren’t automatically stopped behind vehicles waiting to turn left onto Glen Road. If the shared lane is open, vehicles can pass a stopped left-turning car, which Paille said should improve traffic. Where the lines are not dotted, cars stopped behind left-turning cars have to wait. “Drivers have to be patient. It’s more important to have cyclists be safe and not be challenged by cars suddenly pulling into their lane,” Babcock said. And in the long run, say Newton bicycle use and safety advocates like Lois Levin, enforcing the rules of the road and making cycling safer and easier should by extension reduce traffic.